The most recent Star Wars movie was quite a polarising one. A lot of people felt it undid all of the hard work that The Force Awakens had done, while many thought the new, fresh ideas were a welcome change. But even though Star Wars fans are often the most divided fanbase in the world of cinema, there's one thing that we can surely all agree on. And if you don't agree with us, the people of Donegal certainly do. 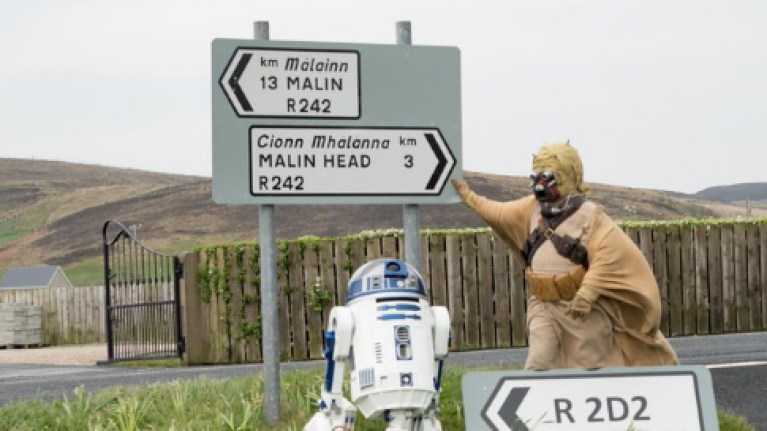 On Monday, Fáilte Ireland unveiled their "May the 4th be with you" festival, which this year extends to Donegal, as well as a large part of the west of Ireland. And to celebrate the festival, the road that was previously known as the R242, has been renamed the 2RD2. Deadly. This is just one of many things that is going down as part of the festival too. It also includes a Star Wars themed 3km Fun Run, Yoda Yoga on the beach and outdoor drive-in movie screenings, all set against the breath-taking backdrop of the Northern Headlands. Excited for this we are. "The ‘May the 4th Be With You’ festival was designed to attract visitors to explore the Wild Atlantic Way, not only over the May the 4th weekend but throughout the year and the addition of Donegal as a location for this year’s festival will certainly highlight all that the North West region has to offer visitors." More information can be found about the festival here.